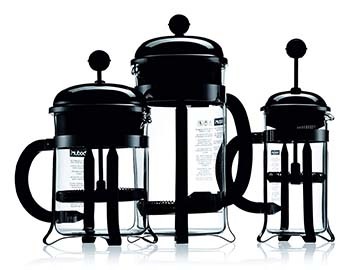 1 What Are the Different Types of Coffee Machines? What’s your idea of a perfect cup of coffee? It isn’t an idle question because everyone’s tastes and preferences are different and there are all sorts of ways to brew a cup of your favorite drink. Coffee can be as simple or as complicated as you’d care to make it. If you’re just looking for a simple caffeine fix to jumpstart your day, you may not care too much about the flavor complexities locked away inside the humble coffee bean. On the other hand, if you’re a coffee and flavor aficionado, and if you’re willing to spend the time, there’s a whole world of rich and satisfying flavors for you to explore and enjoy, and a big part of that involves experimenting with different brewing techniques. When it comes to making a cup or pot of your favorite drink, there are all sorts of options to choose from, and we’ll outline the major ones just below. The good news is, a lot of these coffee-making wonders don’t cost a lot, so you can build up your collection over time, as the urge strikes you, and not worry about breaking the bank. Ready to take a look at the different types of coffee machines? Let’s get right to it! What Are the Different Types of Coffee Machines? Broadly speaking, there are two types of coffee making machines: manual and automatic. It would be a mistake to assume though, that manual coffee makers are always less expensive than their automatic counterparts. While that’s often the case, it isn’t always so. Price tends to be more of a function of design than performance, although it is true that the more bells and whistles you add to a machine, the more it’s going to increase the price. In any case, we’ll approach the subject by first breaking down the types of coffee machines into manual and automatic components, then take a look at other ways of slicing the market into manageable segments as it makes sense to do so. Having said that, let’s take a look at some of the manual options first. There are many attractive options where manually brewing coffee is concerned. Chiefly, manual coffee makers have two key advantages. Portability and price. You can take them anywhere, and in general, they don’t cost an arm and a leg. That’s not to say you can’t find expensive manual coffee makers, but they tend to be the exception, rather than the rule. We’ll outline the most common types just below. If you’re a fan of iced coffee, this is a natural fit. Even if you’re not, there are a lot of coffee purists who swear that cold brewing brings out the full complexity of the flavors of whatever bean you’re using. ​Note that dark roasts tend to have the most complex flavor profiles, so if you’re going to cold brew, you probably want to gravitate toward a darker roast, although any will work just fine. This is what most people think of first when they hear the term “pour over coffee maker.” It’s a robust classic design that’s simple to use and makes a great-tasting cup of coffee. It’s literally as simple as adding your grounds to the pot, pour hot water (just shy of boiling) over them, and stirring carefully. Then insert the plunger and let stand for a few minutes so that the flavor of the grounds steeps into the water. When you’re ready, press the plunger down with a slow and steady pressure, and prepare for coffee goodness! The Aeropress is a strange looking little device that makes a consistently good cup of coffee in almost no time (usually just 1-3 minutes). It looks a lot like a giant syringe. Load your coffee grounds, pour hot water over the top, and let sit for a few minutes as you’d do with a French Press, then depress the plunger to collect your drink! The only drawback is that these gadgets are only good for a cup at a time, but the advantage is that this indeed is a “take-anywhere” coffee machine. If you love coffee and you travel a lot, you’ll find it to be an indispensable device! This is a significant improvement over simple pour-over cones because the water stays much hotter. The principle is the same, however. Bring water to a boil. Add grounds to the clever dripper and pour water in slowly, until you create a slurry. Let the mixture steep for a few minutes, and then place the Clever Dripper directly over your waiting cup and open the valve to allow the coffee to slowly start dripping into your waiting cup. The “trick” here is to be sure that you don’t overfill the Clever Dripper. Only use as much water as the cup below will hold, or you’ll wind up with a mess! This moves us away from pour-over technologies, and onto stovetop models, the Moka Pot has been around for a very long time, and like most other manual coffee making machines, is a lesson in simplicity to use, but it does require several steps and can almost feel ceremonial. This is a simple stovetop pot, made of three chambers. The bottom-most chamber is filled with water. The chamber above is filled with your fresh-ground coffee, and the upper chamber, which is where your coffee will “magically” appear. Of course, it’s not magic at all. Where espresso machines rely on pressure, and drip-brew machines rely on gravity, Moka Pots rely on steam to convey the water through the grounds and into the upper chamber. When brewing, most manufacturers will recommend leaving the top lid open until you start seeing coffee, in the form of very dark steam appearing. As the brewing process continues, the steam and coffee will get increasingly light in color, and when it’s about the color of honey, it’s time to take it off the eye of the stove and close the lid. The last step is a bit tricky and takes some practice. To stop the extraction process, run the bottom chamber under cold water. 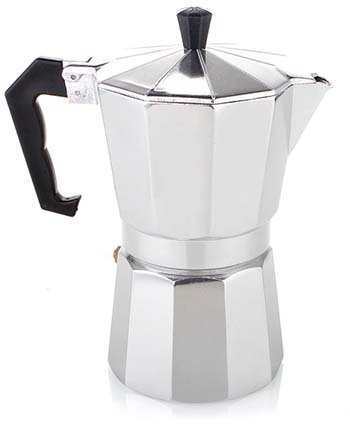 Until you “learn” your stove and the Moka Pot, you may have to suffer through some under, or over-extracted coffee. Once the coffee stops bubbling up and out, pour into your cup, sit back and enjoy. 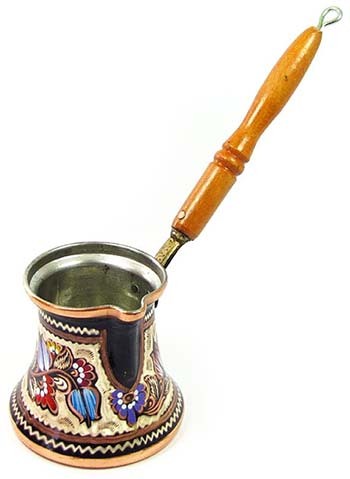 Similar in some ways to the Moka Pot, the Ibrik is a specialized pot used to make Turkish coffee. Traditionally, it’s small, beaten brass pot with a long wooden handle. A word of warning: Turkish coffee is not for the faint of heart! To say that it’s intense is an understatement, and it’s too much for some people to handle, but those who love it don’t regard anything else as being “real” coffee. The brewing process is simpler than it is with the Moka Pot. Simply add your ultra-fine grounds and cold water to the Ibrik, stir, and slowly heat the mixture. Watch it closely, and remove it from the heat just before it boils over. Let it cool down for perhaps 20-30 seconds, and put it back on the heat until it reaches that same point again. Some people even like to do this a third time, but that’s up to you. Your basic goal here is that you want to brew your coffee for as long as possible without degrading the foam that forms at the top of the Ibrik. Once you’ve taken the coffee off the heat for the last time, pour it from the Ibrik into your waiting cup. It should have a nice, luxuriant layer of crema on top, and the body and texture when you drink it should feel almost…sludgy. That’s how you know you’ve done it right! As with the Moka Pot, brewing coffee in an Ibrik can take on an almost ceremonial quality which some people enjoy almost as much as drinking the finished product! As handy as manual coffee makers are, and as indispensable for travelers, the reality is that most people find the speed and convenience of automatic coffee makers to be well worth spending a few extra bucks on, and depending on what you’re looking for in a machine, you can pick up some automatic coffee makers that will do a decent job for a song. Of all the different types of coffee machines on the market today, these are the most ubiquitous. Almost every kitchen in America has one of these, so most people are familiar with them. Drip-brew machines provide a simple means of making a consistently good cup of coffee that usually falls short of greatness, although experimenting with beans and tweaking the grounds to water ratio can improve the quality somewhat. You’ll find two basic varieties: Those with flat-bottomed filters, and those with conical filters. Opinions vary on which one makes the better cup of coffee, but the reality is that the difference is marginal, at best. For all practical purposes, they’re identical. Espresso machines are some of the most popular coffee machine types for home use on the market today. That should come as no great surprise, given the popularity of coffee shops around the country, and how many people make a quick stop into their local Starbucks or similar to feed their addiction. Unlike the more common drip-brew machines, which rely on gravity to convey water from the grounds chamber and into the pot waiting below, espresso machines use pressure. On semi- and super automatic machines, that pressure comes from a pump, while on manual machines, you provide the pressure via a lever. Either way, the effect is the same. Water is forced through firmly tamped grounds, extracting the flavor quickly. If you’re considering an espresso machine, you’ve got three options: Manual, Semi-Automatic, or Super Automatic. 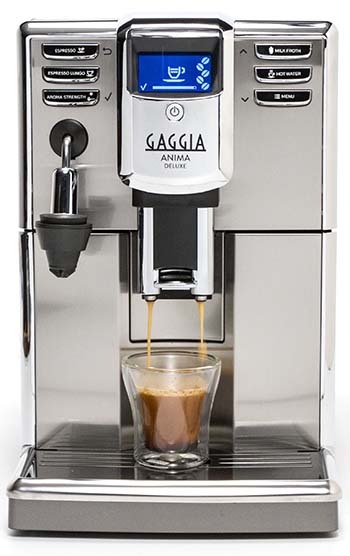 The presence of manual espresso machines means that this category has a foot in both the manual and automatic worlds, but the reality is that the market for manual espresso makers is tiny compared to the rest, which is why we listed this in with the automatic options. Pound for pound, you’ll almost always get more machine for your money by investing in a semi-auto, but super automatics offer a variety of conveniences that make them more popular, on the whole, even though they tend to cost a bit more. At the low end of the market, you’ll find machines that give you a decent, but not an exceptional cup of coffee. As you move up the price scale, the machines offered (for the most part) will give you more options, and thus more control, improving the overall quality of the drinks you create. No matter how you slice it, espresso machines are at the top of the food chain in the coffee world. They are the most flexible and robust machines out there. Brewing Notes: The reason for the “NA” above is simply that you don’t get any choice in the matter. The pod is what it is. 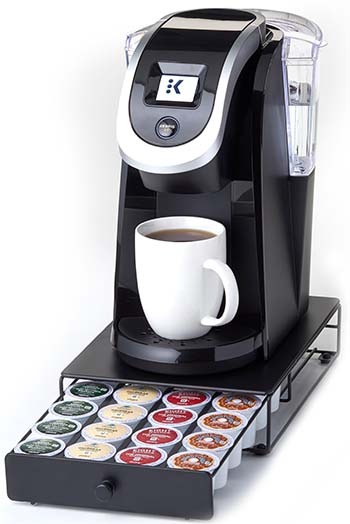 This type of machine was made popular by Keurig, and to be sure; it’s easy to see the appeal. It’s fast, convenient, and you can buy variety packs of pods that will introduce you to a staggering variety of flavors. As good as all that sounds, the truth is that coffee made in machines like these just isn’t as good and flavorful as coffee brewed by just about any other means. Yes, there is some flavor differentiation, but there has yet to be a pod-based brewing system that will allow you to really explore the flavor nuances of different beans and blends. The best comparison we can make is Disney World’s “Global Village” exhibit. You can’t walk through that and make any serious claim that you’ve had a taste of what it’s like to live or be in each of the countries represented there. Same thing with drinking pod-based coffee. You get a manufacturer’s approximation and interpretation, but it’s a far cry from experiencing the real thing. For some people, that’s enough, and we’re not judging. If you value convenience over flavor complexity, then these machines can be a great option. Flavor connoisseurs though will find these machines to be a disappointment. Depending on how old you are, you may have grown up listening to the sound of your parents’ percolator. These things are rugged and durable, and surprisingly enough, still being made today. 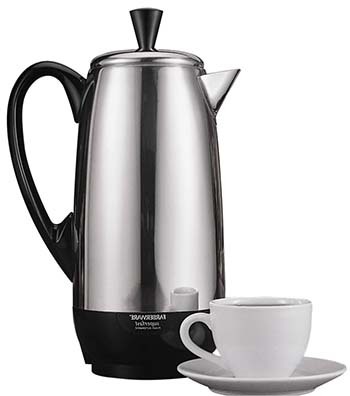 While there is some variation, the basic idea is a stainless-steel pitcher with a lid, mounted on a heating element. Just inside the lid, there’s a chamber for grounds. Fill the pitcher, insert the grounds chamber, add grounds, and plug the heating element in. The water will come to a boil and cycle through the grounds, giving you a steaming hot pot of coffee in a matter of minutes. The thing to be careful with here is grinding your beans too fine. Do that, and you’ll wind up with grounds in the bottom of your cup. For the sake of completeness, we also wanted to include a brief section on professional-grade coffee machines. You'll find two categories here: “Prosumer” models that could be used in the home, but would do equally well serving in a busy office or small café-style environment, and full-on Commercial models. 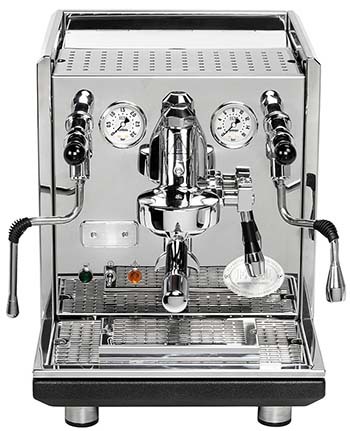 While you’ll find industrial-grade drip-brew machines, far and away the most common machines in this category are espresso machines, and machines in this class have two primary distinguishing features. Raw capacity and most, but not all have the option of a dedicated water line. You can find prosumer espresso machines for as little as a couple thousand dollars and the price goes up dramatically from there, but as a matter of practicality, for the overwhelming majority of the market, these machines are overkill. Unless you’ve got a huge, extended family of power drinkers or are running a business, you’re almost always better served by saving the money and getting a machine more in line with the capacity you need. No matter what kind of beans you use, what roast you prefer, and which brewing method you gravitate to unless you get the grounds to water ratio right, you’re probably going to be disappointed in the flavor of the drink you produce. Different machines will recommend different ratios in their instruction manuals, but our advice would be to ignore those. Instead, regardless of what types of coffee brewing machine you’re using, rely on the 10/6 rule. 10 grams of coffee for every six ounces of water. Start there, and tweak as needed until you get just the flavor you’re looking for. Robust enough to be pleasing, but not so strong as to be biting. Also, if you’re using an espresso machine, you’ll find that you’ve got relative more options for flavor fine-tuning. Do that, and you’ll experience coffee Nirvana, every time you make a cup! As you can see, there are lots of different types of coffee machines – probably more than you first realized! Finding the “right” one for you…the one that most consistently hits your flavor sweet spot can be a real adventure, requiring both time and a willingness to experiment, but if it’s a journey you’re interested in undertaking, you’ll find that it’s well worth the effort. Drink up and enjoy!